Today Naomi who is in the second grade, wrote and drew her day in a life. this time she finished her morning affairs. she wrote, In the morning I get up at seven everyday. And I have breakfast with her parents and her younger sister. But she left alone then. Because her father goes to work, and her mother and her younger sister go to sisters nursery school. Then she clean her teeth. this is a picture in her morning life. All Japanese art work is from Isamu's web pages. We saw your picture it looks like a Restaurant. How do you get to school? I go by car. Do you have school books? How do you get to school Naomi? Do you ride a bus to school? Does your mom come back to take you to school? We saw your picture. We like it because it is so pretty. Do you get on the bus by yourself? Does your mom or dad come to you up after school. thank you very much for writing me so much letters. I'm very glad to read them. How are you? I'm very fine. I'm learning a lot about Japanese langauge. It's very fun for me. Of course I understand Spanish. Because I came from Peru. I'd like to answer you questions. First We don't get bus to school. We walk to school. In my case I walk from my house to our school about 20 minutes everyday except holidays.There are two fitth graders, one third graders and me with a group to go to school. Second, I like dogs. But unfortunately I can not have any dog for me in my house. Third, Thank you for telling me "like a Restaurant" on my picture. But I'm very much surprised to hear that first. Of course that is not a REstaurant, but my house. I forgot to draw my tootpast. Four, our parents do not come to me up after school. We go home after school by ourselves. I go home with my friends in my class. 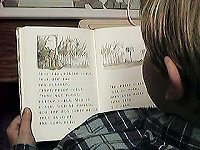 And I'd like to tell that I read "The Letter" by Arnold Lobel in my class. Of course you know well this book. In my international classroom And I'd like to tell that I read "The letter" by Arnold Lobel in my class. Of course you know well this book. In my international classroom there are many pictures from your school. Mr.Shimazaki told me about those pictures. Do you like that book? Where do you think fun? Today I read it again with Mr.Shimazaki. I thought it very fun today that Frog told again and again ,"Oh, Snail didn't come yet." Frod told this three times. Plese write me again soon. Thank you very much for writing to me. Happy birthday Akio! Do you like your birthday? I like your pictures Naomi. I think Frog asked snail to take the letter to Toad because he wants it to be a surprise. Happy birthday Akio. Did you like your birthday present? Can you tell me what you have? Do you like what you have? I like you pictures because it was nice. Frog asked snail to take the letter to Toad because he wanted it to be a surprise. Happy Birthday Akio! I am eight too. My birthday was a long time ago. Your pictures are beautiful, Naomi. I like the whole room! It is creative. Frog wanted to surprise Toad. That's why he asked snail to deliver the letter for him. HAPPY BIRTHDAY Akio! I like your pictures Naomi. Frog asked snail to take the letter for him so that it would be a surprise for Toad, I am going to be eight years old November 25, 1997. I drew a picture for Ashely san. And students in our international class were singing "Happy Birthday to You" for Ashely. It was interesting thing for me. Today my mother come to school. My mother and my teacher with me are talking about my school life. I'm very happy that you all are fond of my drawings about Frog and Toad. I want to draw another picture next time. About my birthday on Sep. 8, my mother helped to my birthday party. She bought many candys and a large cake. They were putting on the table. And of course there were many present for me. That's all.